Ideally, children will learn about money management from their parents. After all, unless a student majors in finance or economics, the finer points of money management are not covered in the classroom. Begin with a stable personal money management system and teach it to children early. Teenagers will always want something; teach them money management by making them earn their next cell phone, iPod or other electronic gadget. Video games, toys and clothing are all famous for being new every single year. Owning the next best thing is important to teenagers for social status and can be a source of enjoyment. Acquiring a massive amount of possessions should not be the goal for teenagers. Before starting the process of buying a new gadget, focus on the importance of downsizing. Sell an old cell phone, assuming it’s not broken. Donate old clothing and re-gift old toys. This will cut down on clutter and help teenagers realize what things they really need or want to have in life. The concept of wise money management does not apply solely to buying useful things. Applying this to how money is spent, regardless of the purchase, is crucial. Teenagers should not just buy the first item that fits their requirements. Shopping around and comparing prices or quality often means a more satisfying and prudent purchase. Secondly, sometimes spending is, surprisingly, more efficient then saving. A fifteen year old may think that saving up for gas money when they can drive the next year, is more efficient than buying that new bike. However, the new bike offers useful enjoyment now. Saving up gas money will not amount to enough cash to last very long with gas prices today. Taking a part time job to fund a driving habit is a smarter idea. The difference between cash flow and saving is intrinsic to understanding lifetime financing. Celebrities are often lauded by how much they give back to the community. Teenagers should be as well. Instilling a charitable attitude in teenagers will give them the tools of compassion and discernment. It may be more fulfilling in the end to sponsor a child in a third world country, or give to the SPCA then buying that brand new video game. Educating teenagers about money will not be an easy process. Giving in and just giving them what they want instead of making them earn it will often be easier. However, this disservice will harm them down the road. Stay firm and kind while educating them, because the bank will not treat them that way when they begin making mistakes with a credit or debit card. 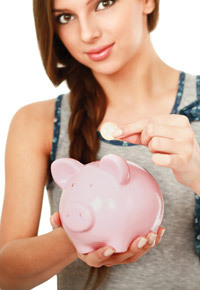 It is up to parents to facilitate financial responsibility in teenagers.